Maybe it's because my own garden is covered in a blanket of snow. Or maybe the latest Burpee's catalog has inspired me. Or maybe it's because today is hubby and my third anniversary. 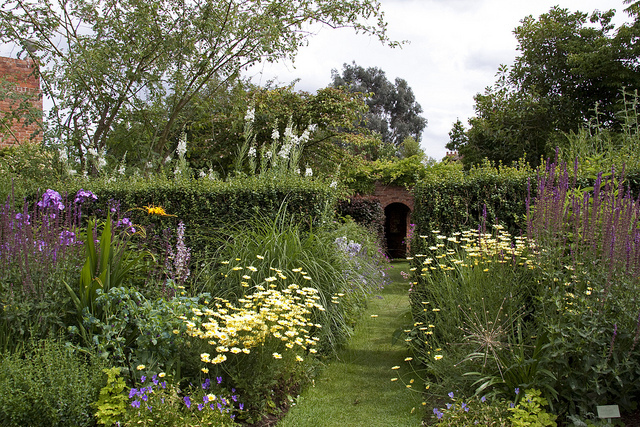 Whatever the reason, I fancy a stroll through cottage gardens today. 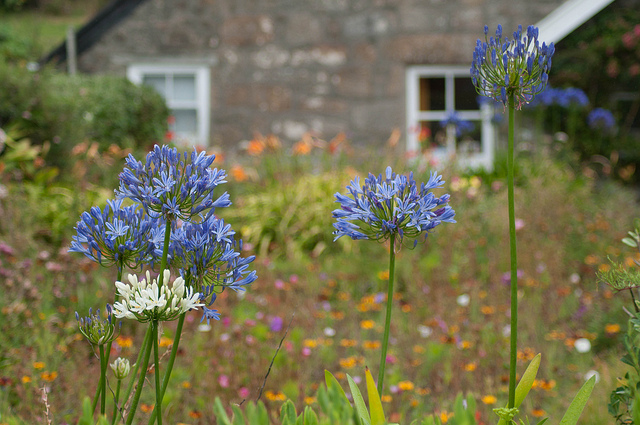 "Agapanthus on Tresco" Photo by Rob 'n' Rae: http://www.flickr.com/photos/rob_cornelius/4878141683/in/photostream/ Some Rights Reserved. I'm going to indulge myself, and take you with me. That is, if you want to come along. You do, don't you? I thought so. What's prettier? The garden, or those blue shutters? 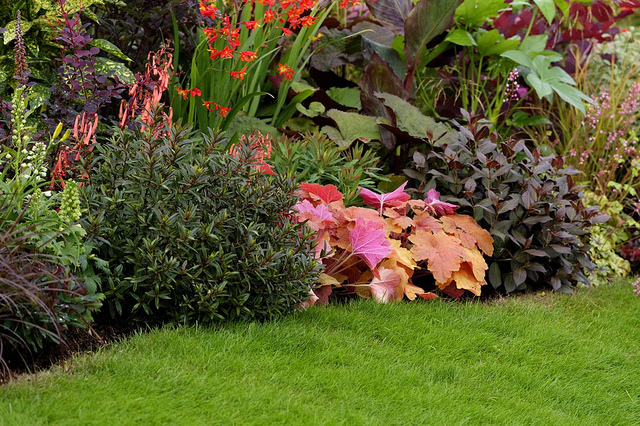 Beautiful color contrast in this garden, don't you think? 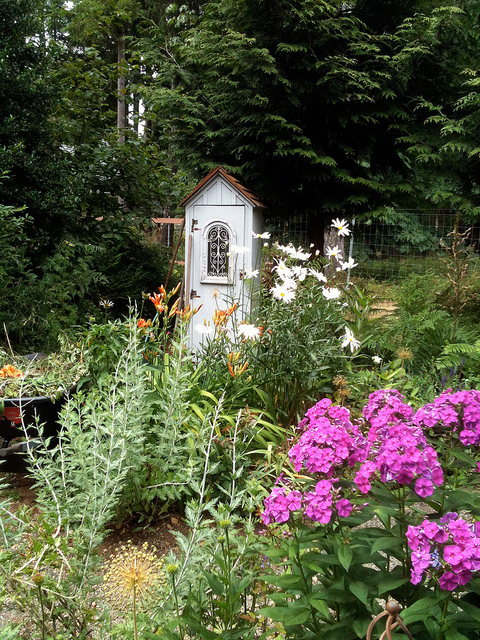 The little white cottage adds architectural interest to this perennial bed. I believe that's phlox in the foreground. Pretty pink. I love the patina on this sundial. Paired with the delicate flowers the effect is very romantic. 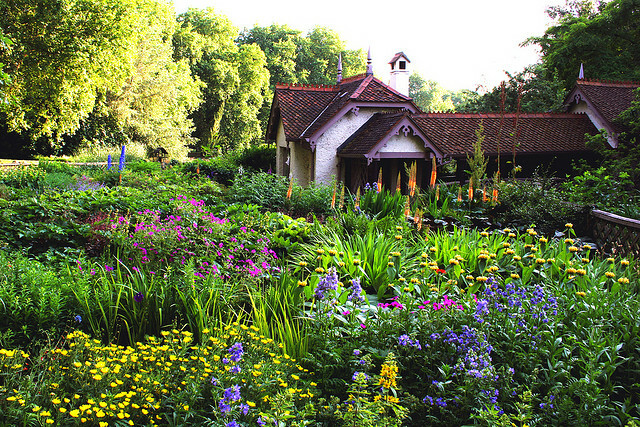 This photo reminds me of a cottage garden I once planted in Illinois. 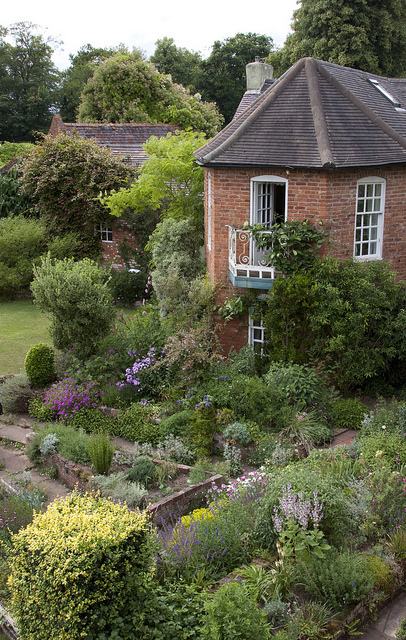 Imagine standing on the balcony looking down on this lovely cottage garden. or bursting with vivid color. I have a brown cottage with white trim. 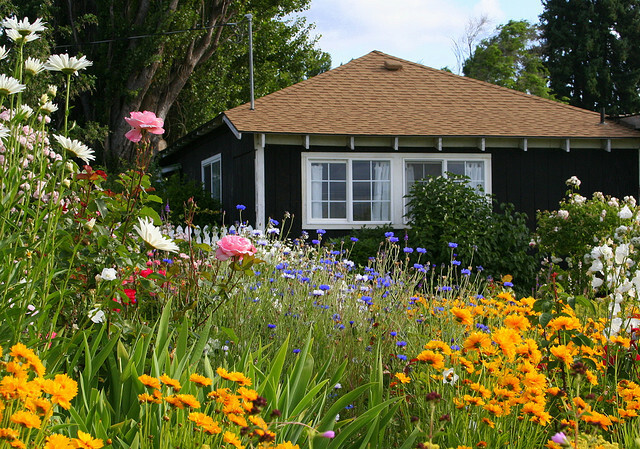 Now all I need is a stunning cottage garden like this one in Hood River Valley, Oregon. 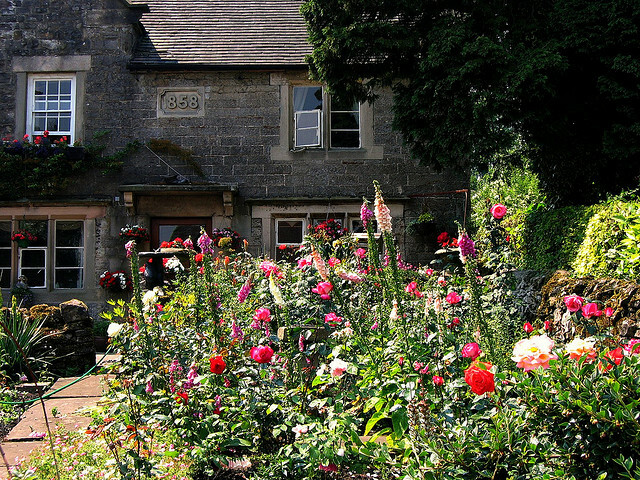 The pinks and reds in this Derbyshire cottage garden pop against the gray stone walls of the home. 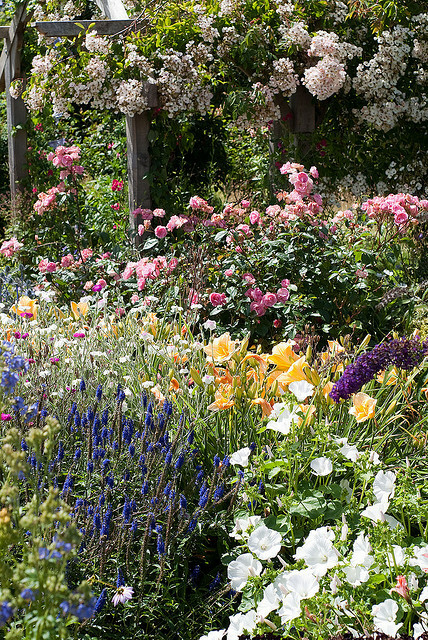 A beautifully blended cottage garden. Like a Monet painting. Striking purple and yellow blooms. So cheerful. 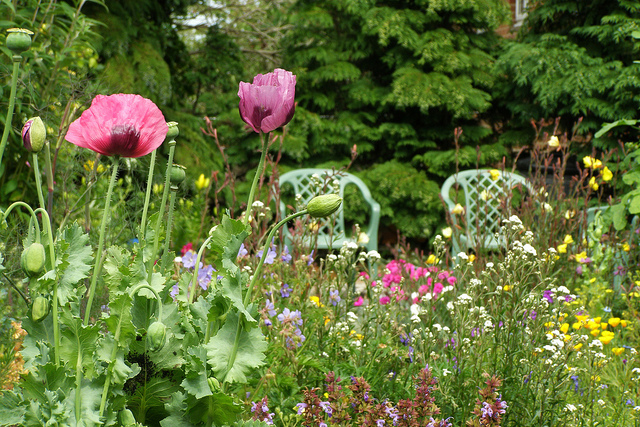 This is very much a "planned" cottage garden. Stone borders and walkways lend formality. 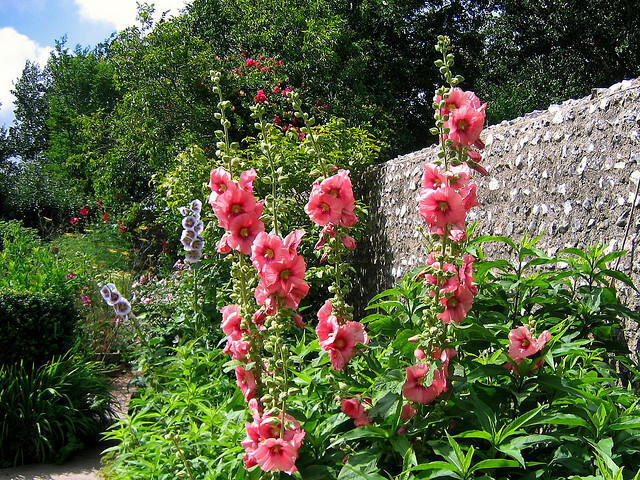 Pink hollyhocks always say "old-fashioned cottage" to me. I do like them. Well, we're at the end of our stroll. 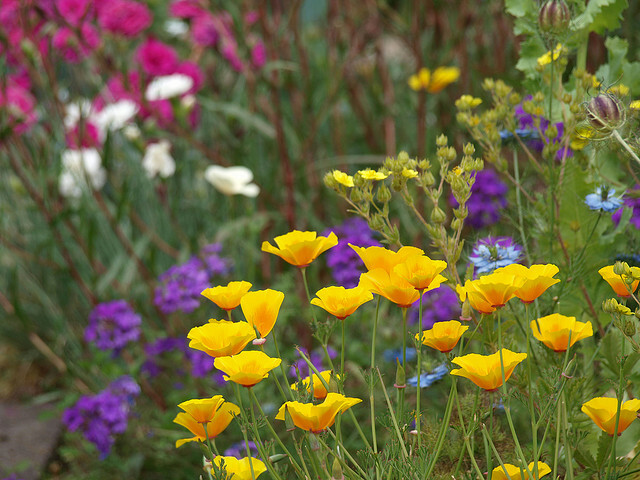 Did you enjoy the cottage gardens as much as I did? Today is Valentine's Day, and I pray yours is filled with beauty and joy. Wow!!!!!! The pictures are amazing! I love the Stone House Cottage Garden and the lovely balcony!! Happy Anniversary to both of you! How romantic! 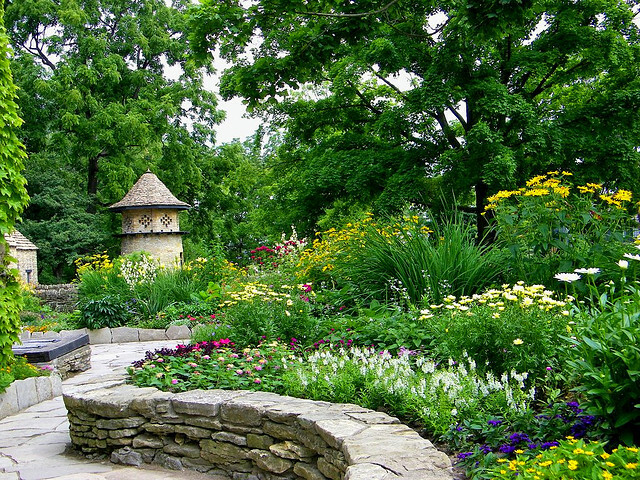 Your garden stroll was just what the dr. ordered. 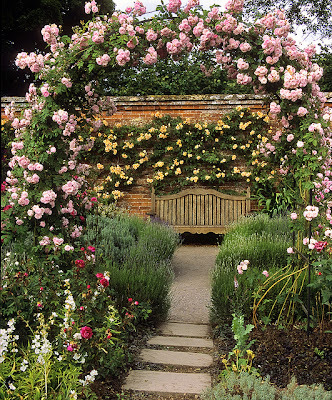 I am partial to the overgrown English country gardens, especially walled gardens with paths that meander and the soft dreamy colors. 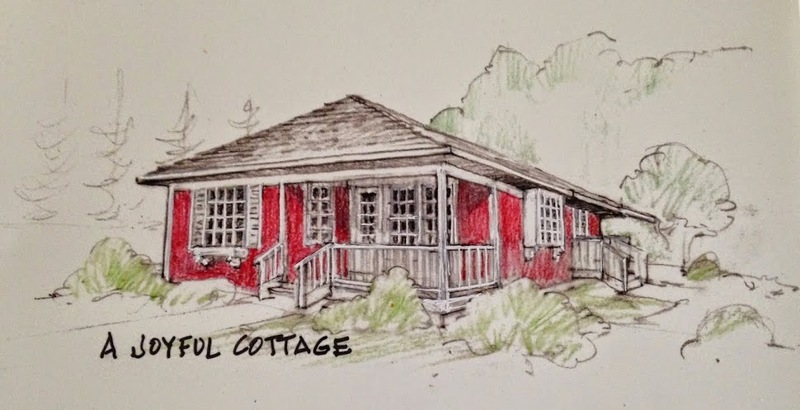 But that little brown cottage calls for the brighter colors and is charming. 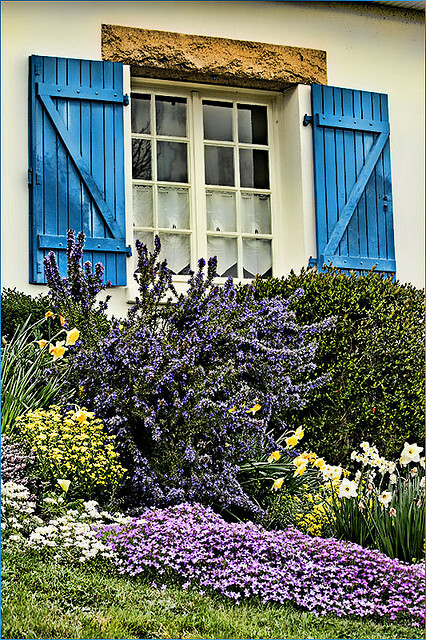 I do also love the Brittany cottage with those blue shutters and that lavender. 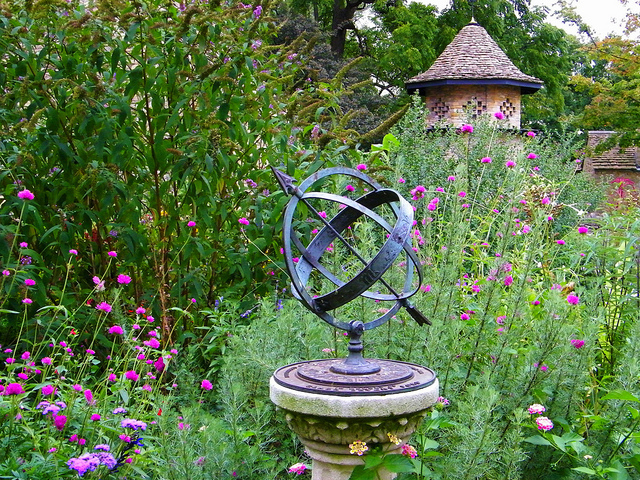 And I would love to have that sundial. This was good, dreamy, I feel the sun on my back! Thank you, Dewena. I am very blessed. So glad you enjoyed our stroll through the gardens. Hope your day is filled with happiness. Hugs. What a wonderful stroll that was! We planted some of that pink phlox last year because our granddaughter loves pink! What a sweet gesture. I love phlox. Especially pink. Oh thank you for this lovely stroll. 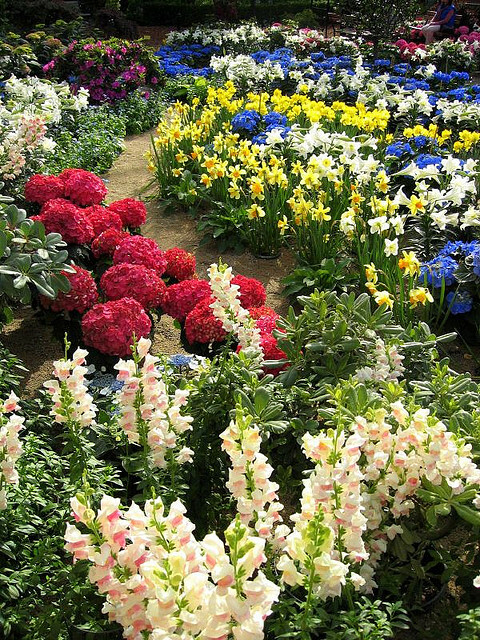 Gardening is my first love (next to my family and faith) of course. These gorgeous photos surely brightened my day! p.s. Happy Anniversary to you and hubby! 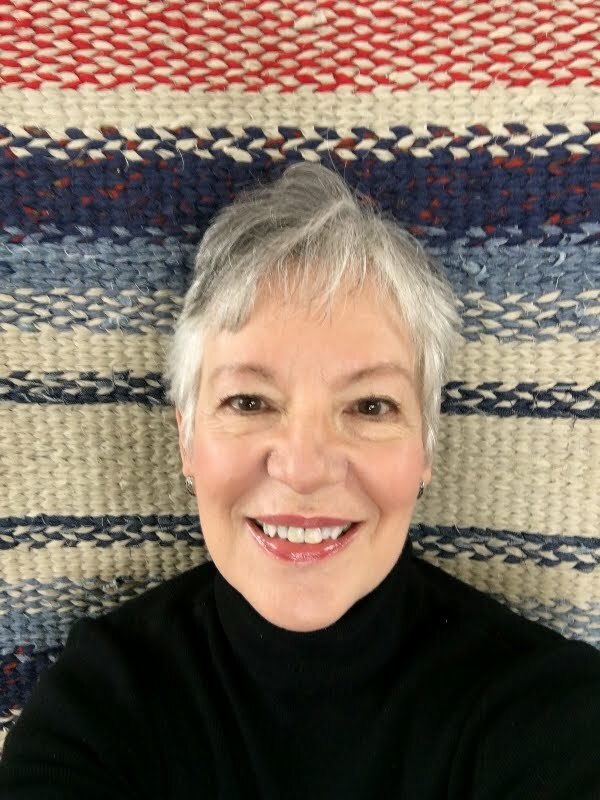 I love that photo at the top of your blog. What a great shot! All the pics are great, but that one makes you want to sit and linger there on the porch. It definitely captures a moment in time. Thank you, Rian. The header photo is of a very special place. That's the Fawnbrook Inn in Allenspark, Colorado, where my husband and I were married. 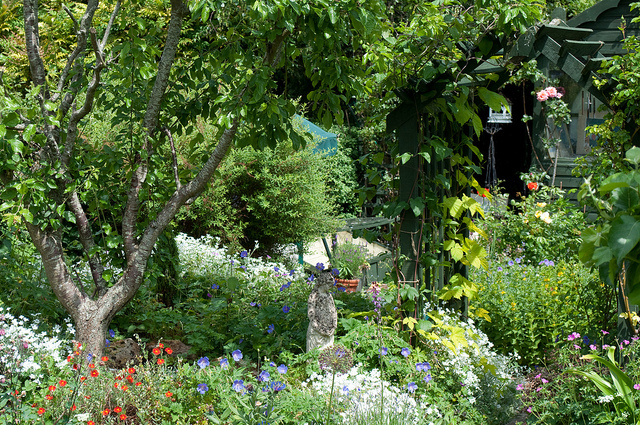 I love going there; especially when Mieke's garden is in bloom. 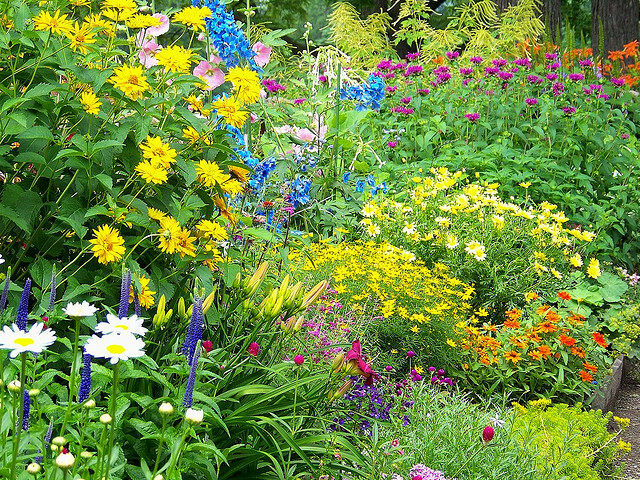 I am trying to just get a swath of my yard looking like your Monet garden. I visited Colonial Williamsburg this Fall - and, oh, my - each yard and the gardens - I fell in love! I took today to go visiting my bloggy friends - and I am so glad I got to visit your gardens and cottages - it is so refreshing!